Even though Google recently purchased a billion dollars of personnel and intellectual property from HTC, the Taiwanese smartphone maker isn’t dead yet. In fact, today HTC announced two new phones: the new U11 Plus and the U11 Life. Unfortunately, folks here in the States are only going to have access to the latter, as the 6-inch U11 Plus with its larger 18:9 display and bigger battery is destined only for Asian and European markets. But maybe that’s OK, because with a price tag of just $350, the U11 Life might be the more enticing of the two. That’s because as the prices of flagship phones continue to rise, the phones in the middle are going to be the ones that put the burden on the iPhone Xs and Galaxy Note 8s of the world to prove that they are worth spending three or four times more on something that might be only marginally better. And in a lot of cases, more and more people are finding that they can function just fine with something that costs well under $600. In a lot of ways, the U11 Life is almost the perfect mid-range handset. 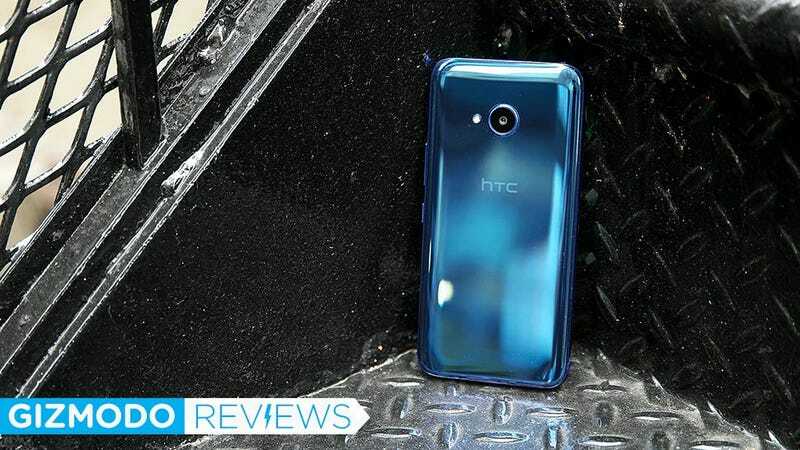 You still get the same curvy body and squeezable sides found on HTC ‘s more expensive flagship, which sports IP67 water resistance, but with a smaller 5.2-inch full HD display (instead of the 5.5-inch QHD panel that comes on the standard U11). The difference this time is that the back is made from acrylic instead of glass, which still feels tough and just as slippery as before, although if you press hard, you’ll notice a slight flex it’s more expensive sibling doesn’t have. The U11 Life’s front isn’t quite as striking as its back. HTC attempts to remedy this by including a pair of its USB-C USonic headphones in the box. And while I would still like a 3.5mm jack too, HTC’s earbuds sound fantastic. Not only do these buds have built-in noise canceling, which is a relief for city-dwellers like me trying to escape the ever-present sounds of traffic, subways, or construction, they totally eliminated the clicking and clacking I heard from my coworkers typing next to me in our office. Big bezels aren’t terrible as long as you put that space to good use. The U11 Life even works together with the buds to create a personalized audio profile to further enhance your listening experience, which let HTC’s pack-in earbuds (which the company values at around $40) deliver fuller, richer audio than the $140 B&O H3 earbuds I usually use. The downside is that if you scrounge up a USB-C to 3.5mm dongle and swap in another set of headphones, all that extra sound enhancement goes away. 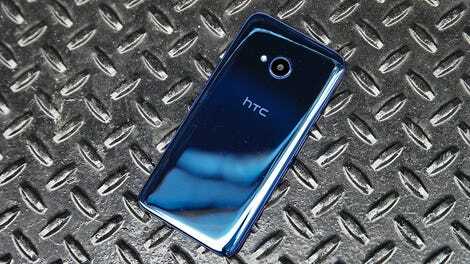 Another sad thing about the U11 Life, is that it forgoes HTC’s legacy of powerful stereo speakers by going with a single speaker mounted on the bottom of the phone that puts out just mediocre sound. The U11 Life’s pic is a little on the dark side, but overall, I think it’s picture is more satisfying to look at. As for the Life’s photo prowess, it surprised me with pics that are definitely above average for something in this price range. When compared side-by-side with a similarly priced phone like the $400 Moto X4, as expected, both phones performed admirably in the daytime. However, for people looking for a tiny bit more detail, the Life’s 16-megapixel rear camera does have a slight advantage over the 12-megapixel cam in the Moto x4. But the real differences appeared when I used both phones to shoot some spooky Halloween decorations. Sure, the HTC’s photo is more under-exposed than the Moto X4’s, but the U11 Life’s is noticeably less noisy, features better color saturation, and is generally sharper that its competition. The U11 Life is pretty, but it’s also a fingerprint magnet. In a time when phone prices are getting increased to ludicrous levels, the U11 Life is refreshingly simple. It’s got all the standard features you’d expect on a modern phone like a fingerprint sensor and water-resistance, along with a few bonuses thanks to its included noise canceling earbuds and Edge Sense pressure controls. I just wish HTC had made room for a headphone jack. But for the price, the U11 Life is very much a solid alternative to the Moto G5 Plus and the X4, just so long as you’re on AT&T or T-Mobile. Will be available unlocked from HTC or in stores from T-Mobile. Compatible with GSM carriers such as AT&T and T-Mobile. Battery life is slightly above average, as it lasted 8 hours and 50 minutes on our rundown test; slightly worse than the Pixel 2 (8:59), but better than the Moto Z2 Force (8:42). The U11 Life has some of the best headphone audio on a phone in this price range, but only when you use the included U-Sonic earbuds. Ships with Android 7.1 Nougat, but HTC says an update to Android 8 Oreo should be out by the end of November.